Landhaus Stricker features an indoor pool and a fitness centre. The hotel offers a restaurant. A bar/lounge is on site where guests can unwind with a drink. A complimentary breakfast is offered each morning. Wireless Internet access is complimentary. This luxury hotel also offers spa services, a library and a terrace. Complimentary self-parking is available on-site. Landhaus Stricker is a smoke-free property. Situated in Sylt-Ost, this luxury hotel is 0.9 mi (1.4 km) from Tierpark Tinnum and 2.6 mi (4.2 km) from North Sea. Sylter Welle and Sylt Aquarium are also within 2 miles (3 km). Westerland (Sylt) Station is 22 minutes by foot. A restaurant, an indoor pool and a fitness centre are available at this smoke-free hotel. Free buffet breakfast, free WiFi in public areas and free self parking are also provided. Other amenities include a bar/lounge, spa services and 24-hour room service. All 38 rooms offer free WiFi, 24-hour room service and flat-screen TVs with satellite channels. Minibars, espresso makers and free newspapers are among the other amenities available to guests. Landhaus Stricker offers 38 forms of accommodation with minibars and espresso makers. Flat-screen televisions come with satellite channels. Bathrooms include a bath and shower and complimentary toiletries. 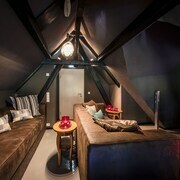 This Sylt-Ost hotel provides complimentary wireless Internet access. Business-friendly amenities include desks, complimentary newspapers and safes. Housekeeping is provided on a daily basis. A complimentary buffet breakfast is served each morning between 8 AM and 1:00 PM. SIEBZEHN84 – This restaurant specialises in regional cuisine. Reservations are required. Open daily. BODENDORF´S – On-site fine-dining restaurant. 1-star Michelin rating. Open selected days. MILES BAR – This bar only serves light fare. Open daily. Guests must contact this property in advance to reserve a crib (infant bed)/sofa bed. Contact the office using the information on the reservation confirmation received after booking. Hotelstars Union assigns an official star rating for properties in Germany. This property is rated 5 stars.